Mr Mohan claimed that his achievement was to get the suburban rail project aimed at reducing traffic. Bengaluru: On a Sunday morning while most of the citizens were relaxing at home, nearly a hundred citizens gathered at an 'open forum' organised as part of the Million Voter Rising campaign, supported by Whitefield Rising, Bellandur Forum and other groups which saw the citizens grilling Bengaluru Central candidates and asking them why they should be voted to power. As soon as the session opened, urban expert V. Ravichander, who was moderating it, asked the sitting MP and BJP candidate P.C. Mohan his single biggest achievement in the last five years. In his reply, Mr Mohan claimed that his achievement was to get the suburban rail project aimed at reducing traffic. Mr Mohan, explaining his plans if he gets elected again, said that he will fight for a separate master plan for Mahadevpura, improving Metro connectivity and development of lakes. He pointed out that the sad state of affairs in the area, especially Panathur, is due to unplanned construction activities. Actor Prakash Raj began his speech by explaining the reasons for his political entry. He said that after journalist-activist Gowri Lankesh was murdered, his visits to different places made him realise that the electoral process itself needed a change and there was a need for participative governance. 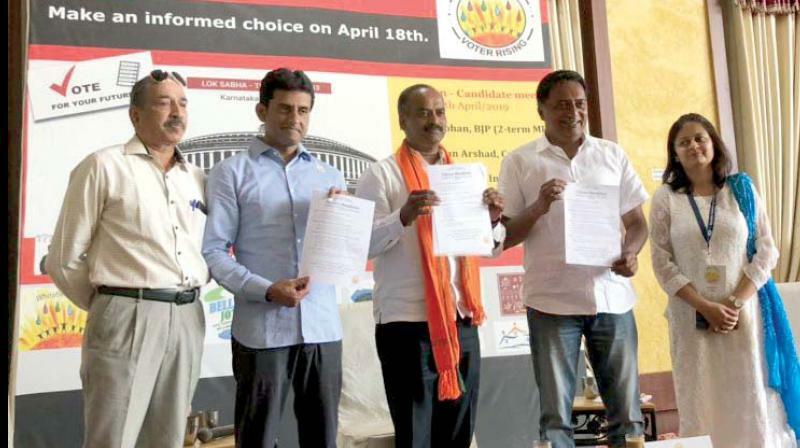 Congress-JD(S) candidate Rizwan Arshad said that if he gets elected, his emphasis would be on the developing of the city and said that Bengaluru is competing with other international cities and need special attention from the Centre. On his reply to citizens who posed him questions on Bellandur Lake and K and C Valley, he said that K and C valley has been completed in a record time and the Congress manifesto is promising special funds for the IT corridor. Earlier, questions for the candidates were collected and curated during the registration process. It was observed that many questions were related to BBMP issues, like water, streetlights, roads and others. The frustration with basics being unavailable in Mahadevpura was evident even though this is an MP election. It said, “The hope is that parties will field better candidates for Mahadevpura, knowing that our vote is informed and not for sale.